Planks are useful endurance exercises which can be done ridiculously easy, yet they can help tone and strengthen the core muscles of the abdomen, back and hips. Planks originate from yoga, and even the most physically fit can benefit from them. Planking is one of the most beneficial exercises for the health of the entire body. Planking offers several benefits for staying healthy and getting fit. Since planking involves all of the core muscles, they can tighten and tone the belly far better than crunches. Crunches are good for a small part of the core, and the focus on the upper abdominal muscles. On the contrary, planks engage the upper and the lower abs and the obliques. By tightening the abs and strengthening the core muscles, planks relax your back muscles and at the same time whip them into shape. 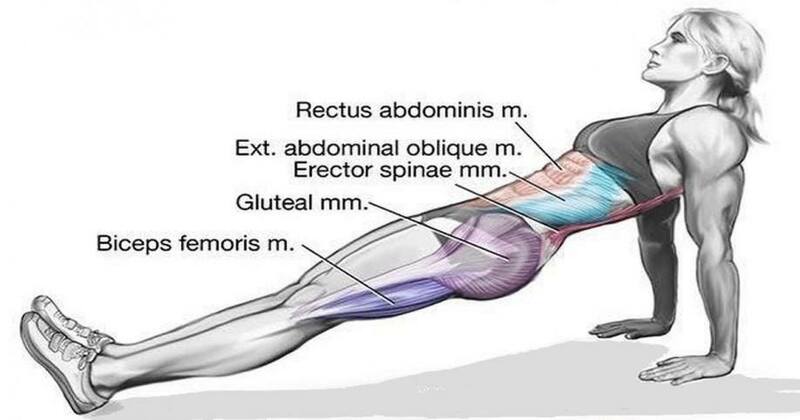 What is interesting is that planks alleviate back tension when your body is at rest. After you have improved the tone of the core muscles, the benefits could be felt all over the body. Planking can make the body more flexible, improve the balance and improve the spinal posture, no matter if you are standing or sitting. People with different level of fitness can do planks. Beginners might start with basic level and gradually progress to a higher level. Some forms of planks can be challenging even to the most physically fit people. Draw the belly button and try to keep the body as straight as you can, not locking the knees. Breathe without holding your breath. Maintain that position for as long as possible. Repeat this for 2 or 3 times. Slowly but surely, lengthen the time of being in that position. Tighten the gluteal and the abdominal muscles and maintain that position for as long as possible. Dropping the hips, shoulders or head during the plank can damage the spinal alignment and can cause injury. Putting the hands too close together can stress and strain the shoulders and it can be more hurtful than helpful. It is important that you breathe normally because you need oxygen for the exercise to have effect. Don’t hold the plank for a long time. Lie on your side placing the forearm on the floor, press the body upward. There should be straight, diagonal line. Hold this position for as long as you would for a basic plank. Sit on the floor and extend the legs straight out in front of you. Then put your hands on the floor aligning them with your shoulders. Raise the body up so that your heels are on the floor creating a diagonal line with the body. The high plank resembles a push-up. In place of pressing up on the forearms which is the case with the basic plank, you align the hands with the shoulders and press on the hands, using your toes in order to balance. If these exercises are done correctly, they can be beneficial. However, if your body shows signs that it is not prepared, take a rest, because you can tore a muscle or damage your spine.Be cautious when taking on a fitness challenge. Try with a slower pace then gradually work your way up to higher levels.